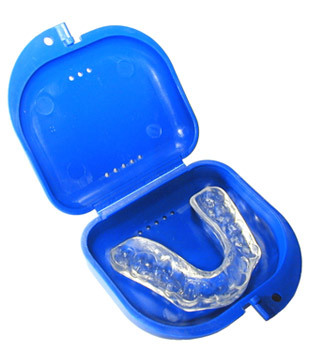 Sports guards and bite appliances serve the same purpose: to protect your teeth from damage. A custom fitted guard or appliance will help keep your teeth safe, without disrupting your favorite sport or your daily life. A rough blow to the mouth during your favorite sport can knock a tooth out, resulting in expensive treatments. A custom made sports guard allows you to compete without having to worry about how your smile will look the next day. Bite Appliances are custom made for nighttime use. Although you might think your teeth are safe while you sleep, grinding and other excessive movements of the jaw and mouth can cause major problems. Grinding your teeth while you sleep is fairly common and can lead to the wearing of enamel, neck and jaw pain, chips, and in major cases, cracks in teeth. If you are suffering from any of these symptoms, make an appointment or give us a call. We will also be on the lookout for any warning signs during your regular hygiene visits. If you need more information about Guards, Bite Appliances in Lakeland, contact us today.